Forecasting cash flow over six or 12 months can be a daunting prospect for a small business owner but it has many benefits. You’ve actually been doing some sort of a cash flow forecast ever since the idea for the business first sprang into your mind. These are all fundamental questions to consider. And when you think about the answers, you’ll get a fuller sense of the benefits of forecasting cash flow for your business. Gaining an expectation of whether the business will have any short- or long-term cash deficiencies. Will you have the cash to purchase necessary items needed to grow the business, such as inventory or equipment? Will you be unable to meet future tax debts? With cash flow forecasting, you’ll be able to make decisions about whether you need to find a financing option (such as an overdraft or loan). You may find out that the business simply isn’t going to be the retirement cash cow you were hoping for! Being able to identify areas of your business that can be improved. For example, if customers are consistently paying you late, this will cause a strain on your cash flow. You’ll be able to assess the impact and determine how important it is to take action to hasten the payment process. You might decide that accepting credit cards is worth the cash flow benefits, even though it’ll cost a merchant fee. Ability to assess the potential and flow-on effects of making business changes. This includes decisions such as employing new staff, changing your pricing structure, plans for expansion, and other key aspects of your business. Preventing your business going the way of a large proportion of small businesses, which sadly go out of business within their first two years because they run out of cash. For many of these, the business idea might have been great but they just weren’t able to fund it until it became successful. You can be guaranteed that the owners of these now defunct businesses unfortunately did not prepare realistic cash flow forecasts. Predicting how much the business can afford to pay YOU! This is the most important benefit, as you wouldn’t be running the business otherwise! Cash flow forecasting can be as simple or as detailed as you like but the real value comes from the thought that you put into it. No one has a crystal ball but, if you can try your best to be realistic about what you expect your business to experience in the future, your forecast will be much more useful. There’s no point factoring in a 30 percent growth in sales if this is an exaggerated goal; use a realistic growth rate to get meaningful value from the exercise. Select the forecast duration. You might like to look at the next six or 12 months, or perhaps look even further ahead. Remember that a longer period will be less accurate, as it becomes more difficult to predict into the future. Consider all income streams of the business and calculate expected future sales month by month. This might be based on the current sales pipeline or by simply applying a growth rate from the previous year. Remember to factor in expected sales changes from marketing campaigns. Go through each type of expense and enter predicted future costs. For many overheads, this will be easy. For example, rent and telephone expenses could be the same every month. However, categories such as casual employee wages or materials/inventory purchases could be much more difficult to plan for and require careful thought. You may need to link these costs as a proportion of something else, such as sales. The result is that you’ll hopefully have a chart showing the expected bank balance at the start and end of every month over the forecast period. 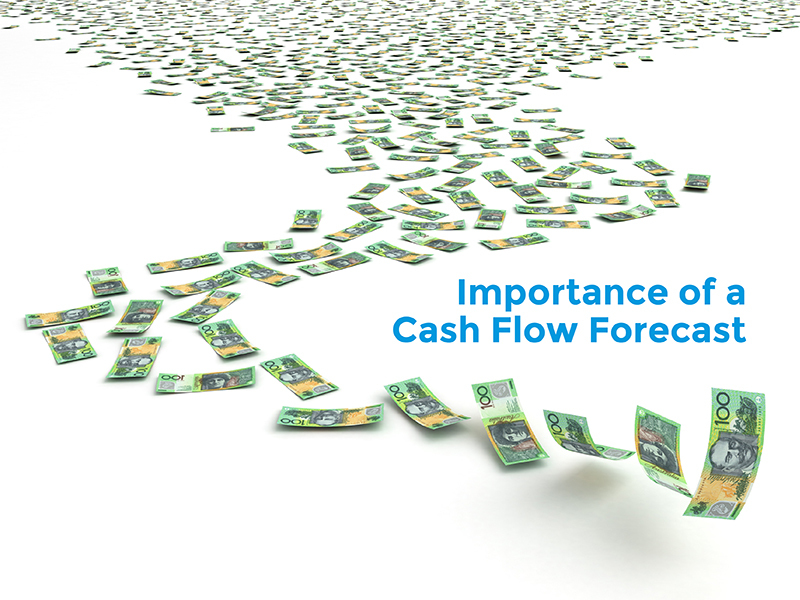 Need help preparing a cash flow forecast? As a small business, you likely won’t have enormous cash reserves to fall back on when times are tough. The benefits of cash flow forecasting are clear for monitoring your performance against goals for the ensuing months. If you would like help preparing a cash flow forecast, we’re experienced and can help you work through the process of predicting alternative outcomes. What would your cash flow look like if you hired a new salesperson who might take 4-5 months before starting to bring in decent sales? What might happen if you increased prices by 10 percent but sales volumes drop? Contact us today to start putting this incredibly valuable business tool in place.